Every year, I like to take the opportunity to review what I like to call an "alternative holiday film" - something that evokes elements of the season while being far from the traditional tropes. In this case (pun intended), being snowed in while traveling on holiday on The Orient Express. 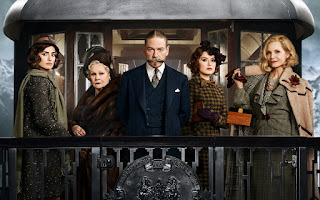 Poirot has long been a favorite of mine, and while David Suchet's fussy turn as the great Belgian detective remains impressive beyond words, Kenneth Branagh's interpretation is less closed off and more emotionally vulnerable. It's a tack that won't appeal to everyone, but I thought it was a remarkably fresh take on the classic character - particularly since this case proves to be one of Poirot's most ethically challenging. There's a gravitas to the entire piece, from the imaginative cinematography to the pitch-perfect screenplay adaptation by Michael Green, that seems wholly appropriate to breathing life back into one of Agatha Christie's most famous and compelling mystery novels of all time. The film opens with Poirot in Jerusalem in 1934, solving a case with his usual air of savoir faire; but with less zeal than is due one of the greatest sleuthing minds of all time. It's an important moment as it shows our man of the hour as exacting in his standards but nonetheless rundown. As many of us do in such times in our lives, Poirot decides to give himself a break by heading to Istanbul; but quickly finds to his disappointment that yet another case demands his attention in London. He runs into a good friend who offers to book him on the plush Orient Express, which will take him through the Alps and onto France, where from there he can make his way to his next appointment. Unfortunately, it is trouble from the start as at first the train is completely booked, but Poirot agrees to share a compartment in order to make it on and takes comfort that perhaps he and his glorious moustaches (truly, never were there such voluminous multiple whiskers before) can simply catch a break as well as the train. His marked frustration is more apparent than the perpetually unperturbed Poirot that Suchet projects, and it adds a tone of relatable humanism to the famously large ego of the "little Belgian." For the first time in a long while, I was impressed with Johnny Depp. His turn as the malevolent Edward Ratchett, with a gravelly Brooklyn accent was the right balance between fearful and pugnacious, as befitting his character (without giving the plot away). Most of the sets and costumes were faithfully in keeping with the time period; but I noticed the distressed leather jacket that he wore when he first stepped out stood out a little too much from the rest. I could only imagine that was a bargaining chip between him and Branagh; I can almost imagine him saying, "Okay, I'll play it straight just this once, but you gotta let me wear a weird jacket, man." Under Branagh's careful eye, I couldn't help but sense that everyone in the star-studded cast was polished, turned out, and bringing their very best acting chops to the table. I especially liked that each actor tried to sidestep their typecast roles that they tend to be known for (Willem Dafoe as a professor rather than the tough guy; Penélope Cruz as a maid rather than a femme fatale, etc.) and see them all bring something new and interesting to the characters. Most impressive was the cinematography; which certainly employed every inch of the big screen. It was an appropriate and effective use of CGI to show the lightning bolt striking the Alps and sending down the avalanche of snow in front of the train, which broke up the slower dialogue up to that point with an effective piece of thrilling action. Cameras pan through watery cut glass, making concerned faces of the suspects appear blurred and distorted; perhaps shielding the audience from their true intents until the appropriate moment of reveal. Indeed, the train itself is an important cast member; with its elegant frosted glass wall sconces and polished wood panels. To be given the task of filming most major scenes in long, narrow compartments is a challenge that Branagh was clearly up for. In one critical moment in which the body is found in one of the compartments, the entire scene is shot in one unbroken, elegant cut looking down from above; as the characters gather and enter into the room and then back out again. This serves to simultaneously include more characters within the shot as well as seamlessly move from one critical scene into another while side-stepping the messiness of multiple cuts back and forth from one end of the narrow compartment to the other. Characters are tracked through the windows of the compartments; interrogations take place indoors and outdoors, and the audience witnesses the crew of the train industriously shoveling away at the snow to get everyone moving again; a detail that is often lost in and amongst the sleuthing action of previous versions. Poirot, where's your jacket bro? However, the film is not without its flaws. 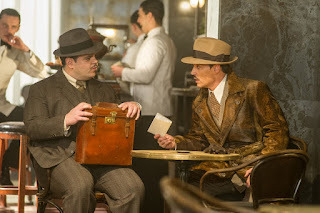 As a detail person, Poirot running around outside and sometimes on top of the train without so much as an overcoat did not strike me as being consistent with the character. Godiva chocolate boxes casually placed within view of the camera for product placement purposes seemed out of place. Most frustrating was a moment later in the film involving a tense confrontation between the doctor and Poirot that seemed not only unnecessary; but frankly, silly. It is almost as if we couldn't be trusted as moviegoers to not fall asleep in the middle of the intrigue if the plot wasn't sufficiently peppered with action sequences. Still, through the crisp white snow and crackling firelight of torches burning outside, the great reveal is made and the train - and life - goes on for Monsieur Poirot and the passengers. Overall, it is a satisfying execution of a classic story that was obviously rendered with a great deal of love and attention that is fun to watch regardless of whether you know the twist or not. Few recent mainstream films go to such great lengths to create a meditative environment on which to ponder the complicated and intricate patterns of human emotions. Jackaroo sez: It's a beauty of a film to watch and while some action sequences seem out of place in the moment, overall the innovative acting and care taken to render this thoughtful take on a memorable "whodunnit" makes it worthwhile.